We're excited to share the features included in our 8.6 release! Version 8.6 was made available in the US data center May 7-8 and all other regions May 22-23. Keep scrolling for highlights from the release, and get full details in the 8.6 Release Notes. Customers using 2013, 2015, 2016 or CRM Online can use our Auto-Update feature to download or initiate an update. All updates are free and simple to complete. We will send out a recording of this webinar to anyone who signs up and will be posting a link to that recording on the release notes. Export and import select email templates from one CRM environment to another! You could always export and import email templates between CRM environments; however, you could only export/import ALL email templates from the environment. Now you can choose specific templates. In addition, the export/import function for email templates now includes the preheader field. And just like email templates, it is now possible to export and import specific form field records rather than ALL form fields, and export/import select domain records from one CRM environment to another in the ClickDimensions Settings area. Don't let your campaign automation emails get lost in someone's mailbox over the weekend! You can now set business hours in our date timers and wait timers. Choose the specific days of the week and times of day that the participant can progress past the timer. Use campaign automations to manage your subscriptions with the new Submitted Subscription trigger! Trigger a campaign automation once a Posted Subscription arrives in CRM, and take actions like adding and removing the participant from the correct marketing lists via the decision node based on what the visitor submitted. 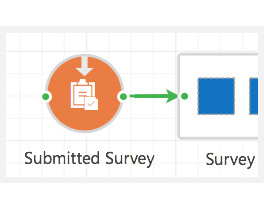 Using the Submitted Survey trigger, you can now launch an automation when someone completes a survey. Using the decision node, choose different action paths based on the survey answers provided. 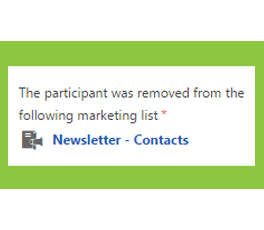 Use the new Removed from List trigger to automatically run participants through a campaign automation if they have been removed from a particular static marketing list. Make sure participants don't fall through the cracks by automatically notifying your team, running a CRM workflow and more. The Series graphic now has a new look, including a counter that shows how many actions are inside of the series. When a posted survey is submitted, it is now linked to the web visit record in CRM. This helps in getting better reporting! The CRM version for your environment is now shown in Settings > ClickDimensions Settings. If the version listed in the settings area does not match the actual version of your CRM, please submit a support ticket so we can update our records. The Attended Event trigger now has a negative path option for an inner point trigger. If a participant of a campaign automation did not attend your event, send them down a different path than those who did attend the event! For the new Profile Management Data Sync feature released in version 8.5, there is now error logging in Settings > ClickDimensions Settings > Error Trace. 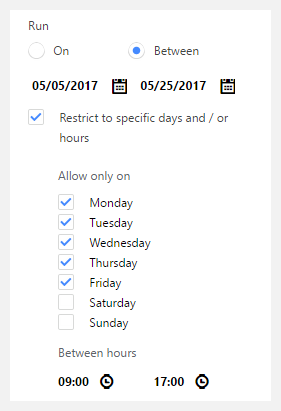 In order to keep the list size more manageable, the Quick Send window will now only show active email templates in the drop down options. Once an email has been sent, the Send and Test buttons will not show in the navigation ribbon. This clears some space for the relevant statistics buttons. In the campaign automation Send Email action, if you choose an email CNAME and save and publish and at some point that email CNAME record is deleted in CRM, you will get a notification about this in the builder. 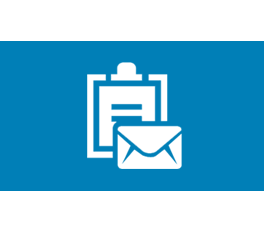 The Subject field on the campaign automation Send SMS action action now checks what the max length of the subject field is on that entity in CRM to make sure the content will fit and send the message. The error trace in ClickDimensions Settings has been updated to run much faster. As a result, errors from before the update will not show up here any more. All errors going forward will show. There are more updates and enhancements included in this release that are not highlighted in this email. And as always, we have also implemented several smaller improvements and fixes. For a detailed breakdown of all the updates, please see our 8.6 Release Notes.